I'm talking to you, G-d.
Today, I felt like everyone was losing you. Yes, G-d, I’m talking to you. We heard the tragic news and your name was on our lips. And we weren’t saying nice things. You see, we don’t exactly get you. We know it’s entirely your fault. That’s how much we believe in you. But we’re starting to expect less from you. As your children, we have some expectations. You brought us into this world without our consent, so we have some demands. Some very basic, basic demands. Like a roof over our head. We also expect you to let us keep the things that you give. You know, like our family. Is that too much to expect? Well, then you should have told us. That’s what I call having some decency. You want us to expect less? You told us you are our father. If we expect nothing from you, we have lost you. So we will always make our demands. And when you cause us pain, we will still want you. Don’t forget that we need you the most when you make us cry. We expect that you will wipe our tears and help us stand straight. Because, though we turn to you in anger and questions and turmoil, we still yearn for your embrace. Always. For only you can heal the wound you created. Yes, true comfort will always come from you. No matter how much you hurt us. I guess we’d rather expect a lot from you - risking everything - then expect nothing and risk losing you. So let us scream at you, throw up our fists, and blame you for everything. You deserve it. But please, respond to our fits with a hug. The kind of hug that tells us you will never let go. And, this time, make us believe it. Recent articles in the US Jewish press talk of Matisyahu distancing himself from Chabad-Lubavitch Hassidut. The artist doesn’t see it that way, but rather is thankful for everything he learned from the sect and is broadening his horizons to include other teachers and teachings within the Hassidic world. 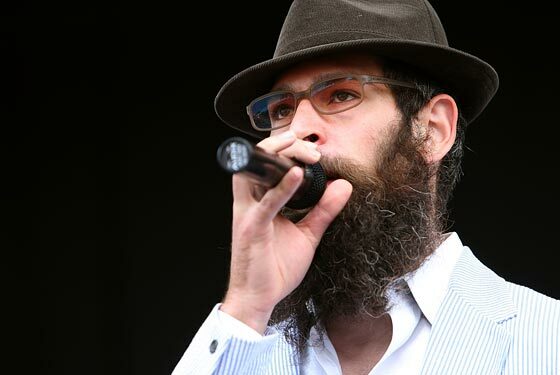 “Now I am interested a lot in Rebbe Nachman [of Breslov], in his teachings and writings and stories,” Matisyahu told Bresky. He said he was writing a song for his next album from one of Rebbe Nachman’s stories. Bresky coaxed him to reveal which story. He relented: “The Story of the Seven Beggars and the analysis of a dream by founding Rabbi Nachman of Breslov,” he said. “I think it’s a good thing to always be changing,” he said. Asked if all his songs about returning to Zion would culminate in his own move to Israel, Matisyahu said a plan to make the Holy Land his home is in the works."